Greetings and May the 4th be with you! Nic here - Sorry that the bar has been a bit absent over the past few weeks. Finals are just now concluding down here at Georgia Southern. As such, I can get back on track with more articles and dealing less with failing students! Today, the Heroes of the Resistance expansion pack was announced. We figured that this was coming at some point but it was sure fun to have it drop on this very special day Jedi celebration day (Sorry Imperials!). Let's jump right into some of the nifty new things that FFG has planned for us beyond the cosmetic changes (aka new dish for Falcon and BB-freakin-8 on Black One). From what we can gather, we have five unique new pilots that were not revealed. Three T-70 X-Wing Pilots and two YT-1300 pilots. 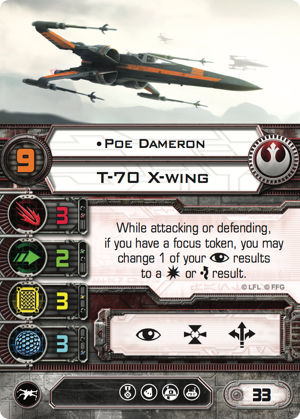 Of the reveals, for the T-70 the new Poe Dameron card hasn't changed much beyond the addition of Pilot Skill 9 and an overall increase in points from 31 to 33. This now places him with the elite pilots such as Darth Vader and Baron von Fel. It also gives Poe players a great deal of options with elite pilot cards (I bet that a new elite pilot card is coming in this expansion as well) as now Veteran Instincts is no longer a must in order to be an efficient arc dodger and play in the sandbox with the big boys. I have been toying with the idea of putting Lone Wolf on Poe as for the most part I find him off on his own dealing tons of damage. Now normally, I would have a TLT on Kyle but sacrifice a bit of damage output for more damage potential on Poe. If you fly it right, it could be a whole bunch of fun. Now onto Rey. Oh my sweet Rey of sunshine. This pilot card excites me as it reads "When attacking or defending, if the enemy ship is insider your firing arc, you may reroll up to 2 of your blank results". 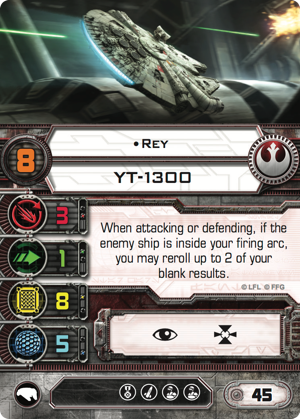 Now Rey gives you a bit more control over what dice to re-roll and when for both offense and defense given your opponent is within your firing arc. 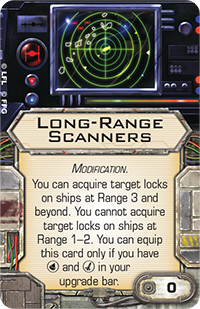 Pair this with the newest Falcon title card, you gain a great deal of potential damage output and defense potential while staying out at range three. 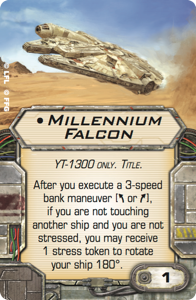 Typically you want the Falcon (usually piloted by Han) up in the mix for a decent amount of time during play to get the range one bonus, but now I can see players flying the Falcon around range three more often. Unfortunately we will most likely end up with high point value for a fully loaded Rey as I do foresee you still needing C-3PO (aka the true hero of Star Wars and of course all Falcon players everywhere). Now squinting closing you can make out the Black One title (for those of you who pay attention to detail look at the crew card right above it and try not to lol). It reads "After you perform a boost or barrel roll action, you may remove 1 enemy target lock from a friendly ship at range 1. You cannot equip this card if your pilot skill is "5 (I think?? or maybe 6)" or lower". This could be fun! Essentially if you move last and you are flying somewhat close to your ships you can remove target locks. Now this might not seem like much given the recent U-Boat meta (do not need TL to dump ordinance), however, think about the upcoming Imperial Veterans card Long-Range Scanners. Now pair BB-8 with Ello Asty with Black One title you can potentially remove two target locks from friendly ships. I see this altering the meta slightly as you will need to bring Gamma Squadron Veterans for TIE Bombers with Deadeye in order to counter this title. Moreover, no longer will Z-95s missile boats be able to push damage through effectively as they cannot take elite pilot cards. If the pilot can pull the correct maneuvers off you may interrupt that nasty Alpha Strike that is incoming. Elicits????? Say what???? Now it is not fully revealed but something that looks like smuggling compartments would give a YT-1300 elicits. That could be fun right? Glitterstim on Rey could be interesting. However, we cannot see that new elicit card but based off the symbol is looks awfully like SLAM. Now SLAM for a big ship could be interesting (considering I have flown my K-Wing off the board once or twice) and could give them some get the hell out of dodge quickly boosts. Overall this expansion will be a nice boost to Rebel players and maybe some fun for Scum. I am very excited to see the Finn and Rey crew cards. What do you think they will be? For Finn I am thinking it will be something related to negating missile or torpedo focuses and/or TL (he does shoot the Star Destroyers missile out of the sky in the movie and all). What do you all think for Rey? Let us know! Peace out for now folks!